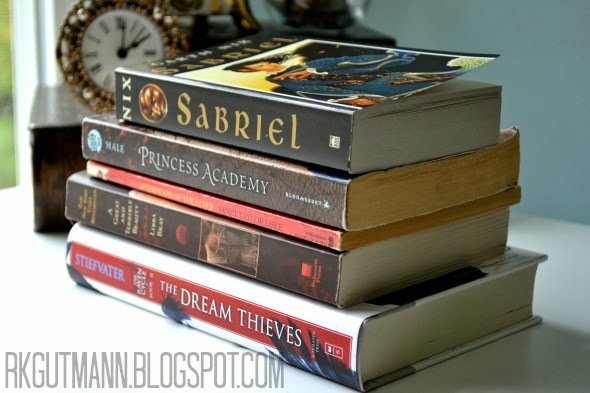 It's been a while since I've put my thoughts about the books I've read to paper screen. I don't have a reason as to why that is other than the fact that I just didn't feel like writing, which is a shame because most of the books I've read this year are greatly deserving of thorough analysis and praise. My month of September was filled with works of Young Adult Fantasy, and they are all very original in their own right. My fellow GoodReaders gave this book fantastic reviews and ratings, so I had high hopes. A young necromancer goes on a quest to look for her missing father. Too bad this quest bored me to tears. The premise had such promise, but the pacing, the characterization, and the writing itself is just... poor. Such odd word choices and repetitive action scenes. Sadly, I wasn't a fan, and I won't be reading anything else by Nix. Don't let the silly title of this book fool you-- it's such a breath of fresh air. I can see why it won a Newbery Honor Award. It falls between children's and young adult lit., and the story is so original and sophisticated that I didn't want to put it down. A young mountain girl attends an academy to learn how to be a proper lady to contend for the heart of the prince. Miri shows such cleverness and strength of character; she's a perfect example of a strong heroine without being one-dimensional. Also, the magic and romance factors aren't forced. They're quite subtle actually, which is so important for the feeling of authenticity. There's a sequel to the book, and Hale also wrote Austenland, which I'd like to eventually read, so I'll keep an eye out for them at the used bookstore. This book was recommended to me by several friends over the years, and it's been so hyped up to me that I suppose it was only doomed to let me down. The pacing is sporadic, the characters aren't at all convincing as Victorian-era teens, and there's very little romance to it if any, so I'm confused as to why it's so often marketed as a paranormal romance. I was so sure I'd love it, too. I really wanted to. Hmph. A short, quick, and moving children's chapter book about bittersweet friendship. I found this little gem at a community garage sale among a bunch of other Scholastic books of yore (I bought up nearly all of them for just $.25 a piece!). What I loved most about it is that it's neither confirmed nor denied whether magic is really at play. Another Newbery Honor Award winner that captivated me. Ahh, saving the best for last. I loved The Raven Boys, and now I love The Dream Thieves even more. It's pretty damn near perfect. All the storylines are touched upon, all the details are fleshed out nicely, there's constant action and revelations, and there's just the right touch of horror thrown into the mix. I really can't say enough good things. This series is quickly becoming my favorite PN Romance series. I've read almost all of Stiefvater's work, and I think this is her best book yet. YA PN fans-- get to reading! As you can see, I'm easing myself back into journaling about books by just giving little, condensed reviews. Maybe I'll have a full-fledged entry for the next book I read. Stay tuned. So sad to hear you didn't like Sabriel, I also hear great things about but I'm turn off if it is not this amazing book that everyone should read.